Mieko Nagaoka, a 100-year-old Japanese female swimmer, finished a 1,500 meters swim in one hour, 15 minutes and 54.39 seconds in the masters swimming competition in Matsuyama, a media report said on Sunday. Nagaoka achieved this feat on Saturday, a news agency reported. Mieko Nagaoka, born in 1914, took up swimming at the age of 82 to recover from a knee injury. In the beginning, Nagaoka did not know how to swim. She used to come to the swimming pool to do exercises for her knee. At 82, she started to learn and swim on her own. Because she performs in a Noh - Japanese traditional dancing dramas, this was also an incentive to learn how to swim so that she would keep in shape for the plays. 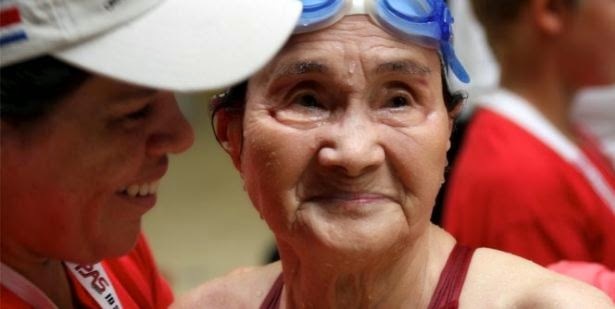 Aged 100, she is now Japan's oldest swimmer and even comes to compete at the FINA masters world championships. When she was 84, Nagaoka started masters swimming in Japan. At 88, she made her first appearance at the masters worlds in 2002 in Christchurch of New Zealand and took the bronze in the 50m backstroke. She was back for more in 2004 in Riccione of Italy where she won three silver medals (50m, 100m and 200m backstroke). She achieved national recognition in Japan when at 90, she set a national record in her pet event, the 800m freestyle. Fresh from her success, she started training with a coach, taking private lessons and trying to improve her record-breaking performance. Her endeavours have paid off since at 95, she brought it to a whole new level, creating her first masters world record in the 50m backstroke. She currently holds 24 world records and plans to win more medals in both long and short course. Nagaoka trains four times a week and in her family, swimming transcends every generation, from her son to grandchildren, and she strongly encourages other swimmers to keep swimming as long as possible.